Despite the protest from local people, the Valjevska Gračanica monastery have been submerged as result of the construction of the Rovni dam. In 1989 the government of ex-Yugoslavia made a project of construction of the Rovni dam on the river Jablanica, located 12km southwest from town Valjevo. The idea of the project was accumulating water to be used in new thermal power plant of Mining Basin Kolubara (has not been constructed yet), as well as source of potable water for municipalities of Valjevo and Lazarevac. The project was stopped in the 1990's due to economic sanctions, while the dam was constructed 20 years later by the Serbian government. Currently, only the final step of the project is missing- filling up the reservoir. In 1990’s local scientist organized public hearings, conferences, and published scientific articles and books. The main arguments against the project were that the dam was planned on the land area with potential seismic activity, as well as the fact that due to an inadequate height of the dam the water from the reservoir would contaminate the local underground water sources. Only after one dam construction worker died and two got injured, in 2008, the municipal government of Valjevo asked national government to reconsider the dam construction plan. Besides other impacts, the reservoir threatened to submerge the local orthodox church "Valjevska Gračanica" originating from the 14th century and the old cemetery, both under state protection for its cultural values. This has mobilized two religious groups “Istinoljublje” and “Gračanica”. They organized several protests, during which its leader, the local church monk, got arrested and charged with attacks on police and archaeologists. In 2010, in order to give it more importance, the church was proclaimed a monastery, while local politicians demanded elaboration of an environmental impact assessment study. 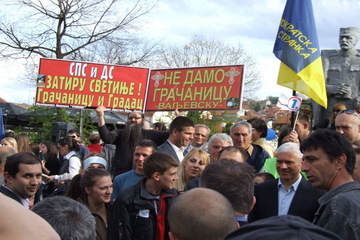 Petition to reduce the dam height signed by 32,600 people was handed in to the Serbian government in September 2012 during the street march jointly organized by citizens, scientists and religious groups. 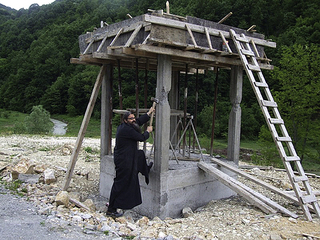 Despite of the local church officials’ disapproval, the dam constructors called on the agreements from 1980 and 2002 signed among the Serbian Orthodox church and Serbian government which allowed for the submersion of the existing local church in exchange to new church that was built in 2009. The Institute for Cultural Heritage, based on the result of the archaeological studies which showed that the church was too fragile to be relocated, rejected to approve the relocation which cause a delay in the dam construction. After the big floods in Serbia in May 2014, the constructors claimed that the dam helped in reducing the flood wave threatening the town of Valjevo. A test filling of the accumulation 'Rovni' began in November 2015. The total capacity of accumulation is still to be decided by the state commission. However, in March 2016 the water level reached the Valjevska Gračanica monastery. The religious group organised several protests in the city of Valjevo and in front of the National Government building in Belgrade. 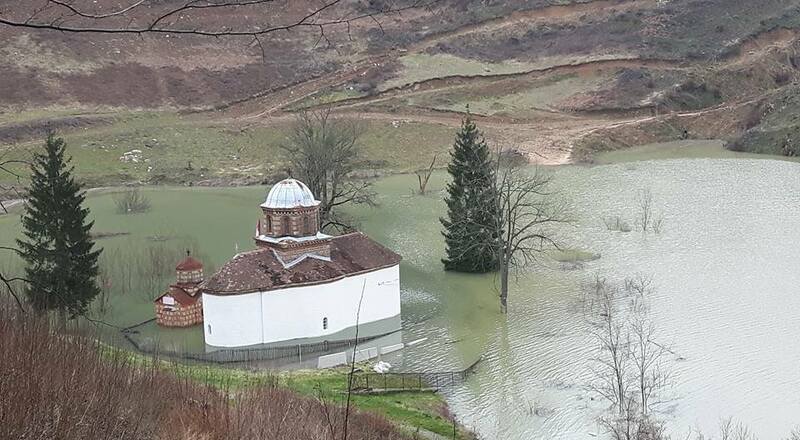 Director of public company "Kolubara" has explained that only one third of the estimated capacity of the accumulation is currently filled and that submersion of the monastery has occurred due to the heavy rains. Project Details The dam's height is 75 m.
The accumulation capacity is 50 million m3 of water. The dam's expected lifespan is 30 years. Development of Alternatives The scientists, municipal government, and religious group suggested a reduction of the dam height for 30-35m to lower the risks of the cracking, which would save the local church from submerging, as well as prevent the possible intrusion of the accumulation water into the underground water sources. The mobilized groups suggested a local referendum to decide on the issue. Why? Explain briefly. The project opponents' proposals to change the height of the dam was not accepted and the construction continued according to the previous plans including a test accumulation filling which resulted in submersion of the Valjevska Gračanica monastery. Petrovic D., Dokanovic P. (2009) ‘Negativni ekoloski aspekti izgradnje brane i akumulacije ‘Rovni’’. Zastita Prirode 1-2, 539-548. Da li je Rovni pomogla ili odmogla? Marsirali cetnici I kozaci: U odbrani svetinje Nemanjića Gračanice i valjevskih izvora! Explanation by the director of public company "Kolubara"
Da li je brana Rovni spasila Valjevo?